Sensory Swing Frames Timber and Steel - Outdoor Sensory Swing Frames Timber and Steel Swings Sets for play and swings frames for therapy. Don't forget to put LOTS of swings on your swing set! Timber swing frames for residential and Steel Swing Frames for commercial use and Heavy Duty use. 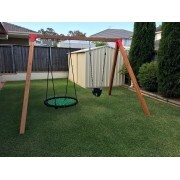 Swing Sets Timber and Steel - Swing Sets - Looking for a SAFE, STRONG AND AUSTRALIAN MADE SWING FRAME for your child? SNPE has a huge range of Residential and commercial Swing Frames to choose from - Free Standing or In Ground swing frames with a huge range of swing attachments to choose from to suite your child's needs. Who doesn't love to swing? 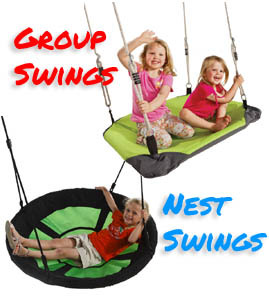 Swinging on a backyard swing set or a playground park swing frame is the ultimate fun experience for children. Remember when you were a kid, what it felt like to swing on the backyard swing set. Kids just love swings. Outdoor Swings and backyard swing sets not only provide fun and play opportunities for children, a swing can be a valuable investment to help children with sensory integration. The area of movement, the vestibular movement of activities such as swinging on a swing frame assists children being able to process sensory input. Swinging on a swing set provides essential vestibular movement to help children achieve normal developmental milestones, not only calming the child but letting them enjoy the simple pleasure of swinging that we all enjoyed ourselves as kids. Vestibular Indoor Therapy Swing Frame (Metal Frame Only) This listing is for the Vestibular ..
Vestibular Indoor Therapy Swing Frame This listing is for the Vestibular Indoor Therapy Meta.. Single Swing Set - Free Standing - Timber swing frame - 90 x 90 Dressed Cypress Pine Tim.. Double Swing Set - Free Standing - Timber swing set - 90 x 90 Dressed Cypress Pine Timbe.. Swing Frame - Single - In ground - Cypress Pine Timber - 115 x 115 Looking for a Strong .. Swing Frame - Double - In ground - Cypress Pine Timber - 115 x 115 Swings sets and swin.. Swing Frame - Triple - In ground - Cypress Pine Timber - 115 x 115 Looking for a Strong ..